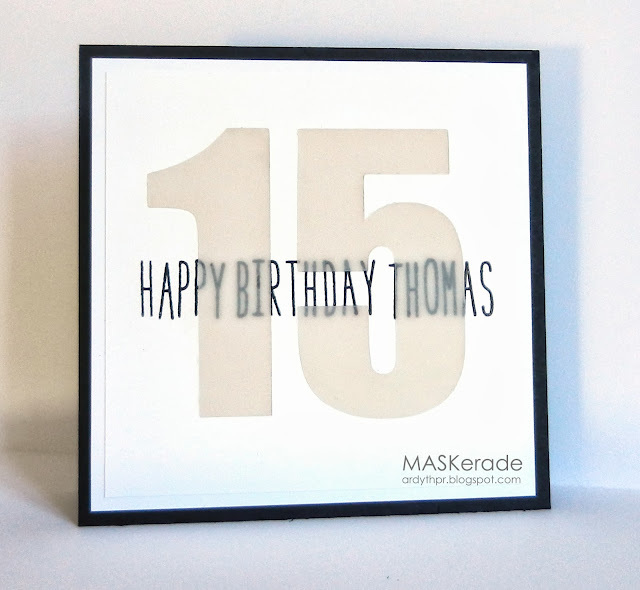 MASKerade: RIC44 - Happy Birthday, Thomas! RIC44 - Happy Birthday, Thomas! I focused on the partially covered spidery looking vines and chose a thin font and used some vellum to convey a similar feel. I cut the front panel using my Silhouette and then cut the same numbers twice in vellum. I took out the white 15 and laid in the vellum 15 before stamping and embossing the sentiment (Milo's Alphabet from Lawnfawn). Then I laid the other vellum 15 on top, so the embossed sentiment is sandwiched between two layers of vellum. huh, I was wondering how you got thick looking vellum that has such a see-through quality. It's because you stamped a vellum sandwich! Love that! Very clever. Thanks so much for giving us a tutorial on how you made your card. Amazing! So glad you explained how you created this classy card Ardyth. I was also wondering how you made the vellum look so thick. Very clever to inlay a couple of layers. Love this look!!! I see you're loving your Silhouette. :) It's a magical machine for sure! Love this, great instructions and are you not loving your Silhouette? Love this Ardyth. This is the perfect guy/teen card. Great design... as always! AMAZING!!! Yep, totally rendered speechless once again by your remarkable creativity and how beautifully you bring those ideas to life! What the others said. lol Most would have just cut out the vellum and glued it over. You took it three steps farther and it shows. Such a clever design and perfect for a 15 year old! I'm sure your nephew is going to love it! I love this! So clean and simple and chic! Nicely done! So perfect in every way! Love it, Ardyth! So glad that you join the fun with us at Runway Inspired Challenge! (ps: too bad that we are both busy at the same time in Chi-town!) Hope you have fUN! Love your use of the velum! Clever engineering. Great card for your nephew. I am so in love with this card! It speaks to my clean and simple heart :) Thanks for joining us on the Runway!